Take Control. Decide On The Type Of Jobs You Want. Simply swipe left or right with your finger to view your Acceptance Rate (AR), Ratings and Cancellation Rate (CR) for Standard Taxi or JustGrab respectively. JustGrab is a service where passengers can book the nearest Taxi or Car available, at a fixed fare. As JustGrab is priced based on dynamic pricing, you can expect to see fares to be HIGHER than usual when there is high passenger demand. 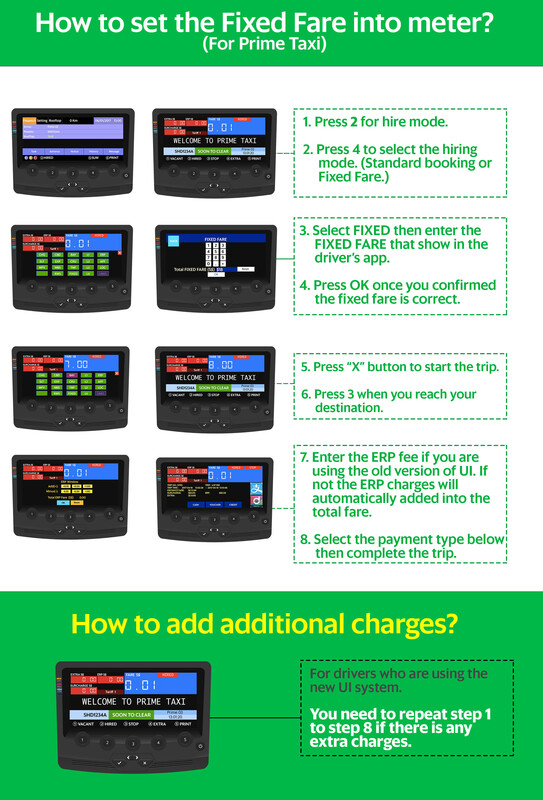 Remember to key-in the fixed fare stated for the JustGrab jobs before starting your trip. 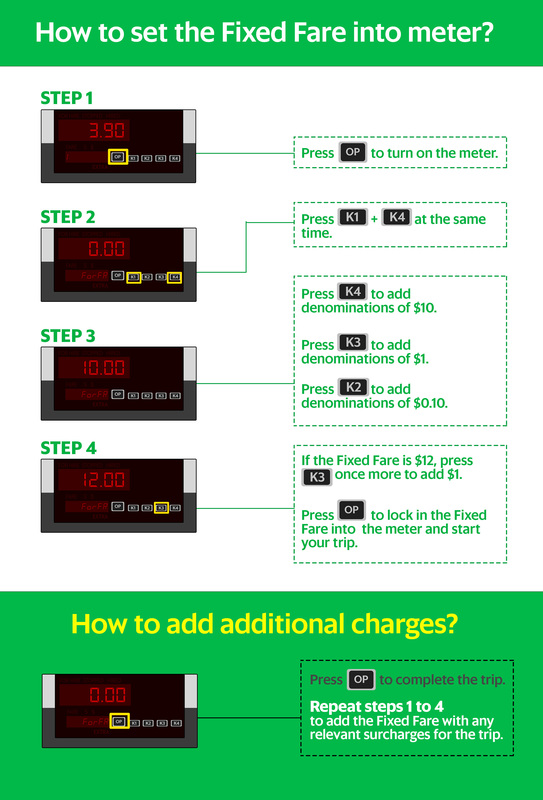 Here is quick step guide on how to key-in the fixed fares. Q1: Can I choose to only do JustGrab or Standard Taxi? Answer: Yes, with the toggle, you can select which type of jobs you want to receive. If you wish to accept both, do ensure to tick both options. Q2: How much commissions/levy will Grab collect for my JustGrab jobs? Answer: Grab deducts 10% of the JustGrab Fixed Fare stated on the job card. For example, if the JustGrab job card states $15.00, the commissions/levy deducted from your Credit Wallet is $1.50 (10% of $15.00). Do ensure that you maintain a minimum of $5.00 in your Credit Wallet. Q3: How long will it take for the settings to be effective? 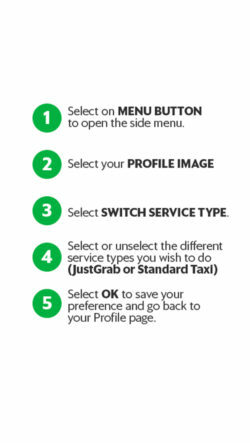 Answer: The settings will become effective immediately when you tick/untick JustGrab and/or Standard Taxi. Q4: I don’t see any options, what should I do? Answer: Please ensure that you are on the latest Grab Driver app version. Do try to restart the app. If the problem persists, please call in to our customer support for further checks. 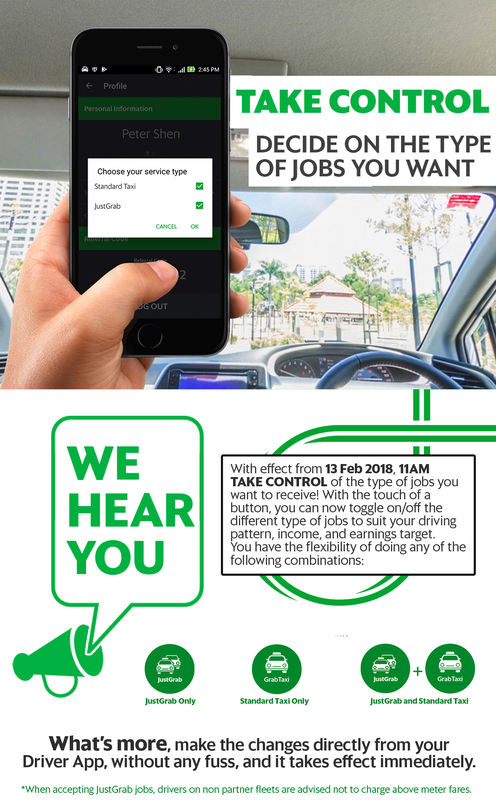 Q5: Where do I go to turn on/off receiving JustGrab or Standard Taxi jobs? Answer: For iOS Users, click on your Profile. Click on Service Type. You can now tick/untick Standard Taxi or JustGrab. Click back to the main page. Do note that at least one service type must be enabled to be able to receive jobs. For ADR Users, click on your Profile. Click on Switch Service Type. 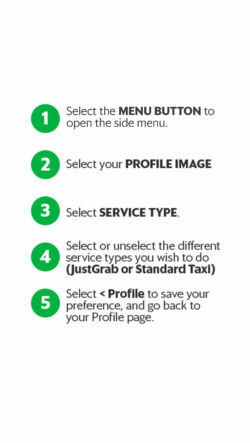 You can now tick/untick Standard Taxi or JustGrab. Click OK to save your settings. Do note that at least one service type must be enabled to be able to receive jobs. 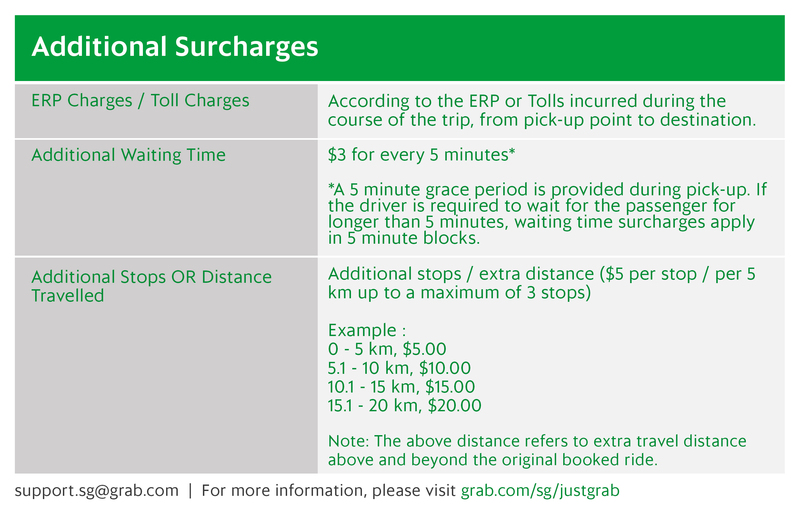 Q6: There is a $2 ERP gantry charge during the trip for JustGrab job. What should I do? Answer: You should charge this $2 ERP charges to the passenger. 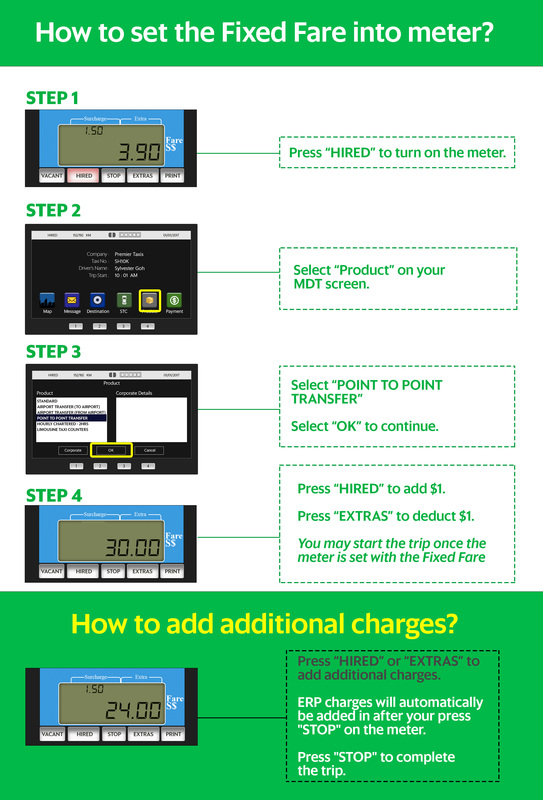 Select the box for “Tolls & Others”, and enter this charge under “Insert Tolls & Others”. Q7: Will there be an option to turn off Advance Booking jobs? 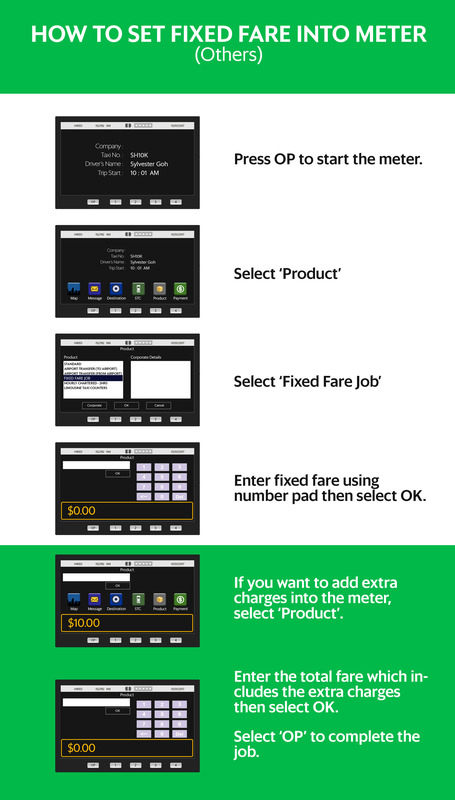 Answer: At the moment, you can only select between JustGrab and/or Standard Taxi jobs. Q8: How do I sign up? Answer: No sign-up is required. Simply update to the latest Grab Driver app version to enjoy this feature. This feature is only available to GrabTaxi Driver Partners. Q9: Can I still take a street hail job? Answer: Yes you may, but please do go offline or switch off the app if you have a passenger on board. This is to prevent your AR & CR from being affected. Q10: When will this be available? Answer: We will notify you via SMS to update your Grab Driver App to the latest version once this feature is available. Q11: What happens to Back to Back jobs? If I select both options, does this means that I will have both JustGrab and Standard Taxi jobs available for Back to Back jobs? Answer: There is no change to Back-to-Back jobs, and you will continue to receive it as usual. With both options ticked, you can get either one as your next Back-to-Back job. Do try to accept and complete the jobs assigned to you as per normal. Q12: If I am a Limo Driver, will this function be available to me? Answer: Yes, as a Limo Driver instead of Standard Taxi, you will have the option to select Limo Taxi and/or JustGrab jobs. Q13: Will the settings be the same when I quit and restart the application? Answer: Yes, the settings will continue to be the same to what was last set. Do remember to check the Settings regularly to be sure of the type of jobs you are going to receive.